Difference between revisions of "NB SQL 9.3"
If a client is connecting remotely and labeled networking is required, then it is possible to use IPSec or NetLabel as discussed in the [[NB_Networking | SELinux Networking Support]] section (the "[http://wiki.postgresql.org/wiki/SEPostgreSQL_Development Security-Enhanced PostgreSQL Security Wiki]" also covers these methods of connectivity with examples). Using the [http://taiga.selinuxproject.org/~rhaines/NB4-diagrams/24-sepostgresql.png SE-PostgreSQL Services] diagram, the database client application (that could be provided by an API for Perl/PHP or some other programming language) connects to a database and executes SQL commands. As the SQL commands are processed by PostgreSQL, each operation performed on an object is checked by the object manager (OM) to see if the opration is allowed by the security policy or not. 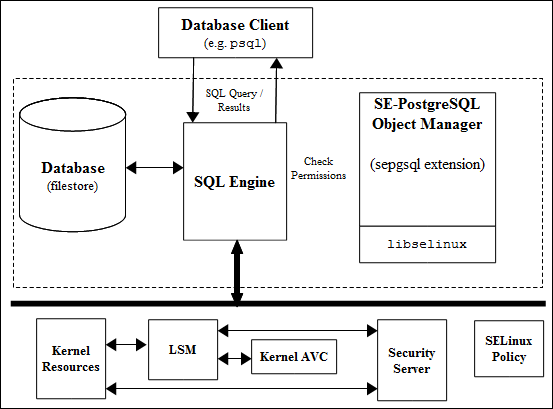 Using the [http://selinuxproject.org/~rhaines/NB4-diagrams/24-sepostgresql.png SE-PostgreSQL Services] diagram, the database client application (that could be provided by an API for Perl/PHP or some other programming language) connects to a database and executes SQL commands. As the SQL commands are processed by PostgreSQL, each operation performed on an object is checked by the object manager (OM) to see if the opration is allowed by the security policy or not. SE-PostgreSQL supports SELinux services via the <tt>libselinux</tt> library with AVC audits being logged into the standard PostgreSQL file as described in the [[#Logging Security Events|outline Logging Security Events]] section.